Sony Electronics, Inc. – a worldwide leader in digital imaging and the world’s largest image sensor manufacturer – today announced that it has overtaken and held the No. 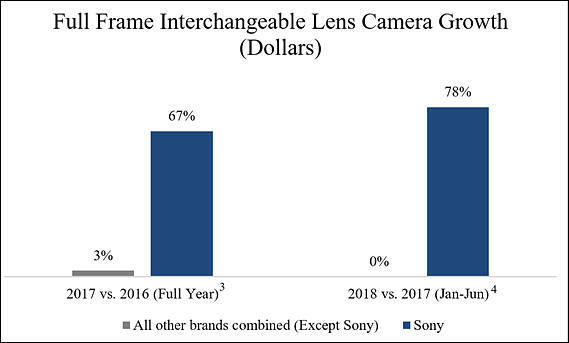 1 overall position in the United States full-frame interchangeable lens camera market in the first half of 2018, in both dollars and units. In fact, four out of every 10 full-frame cameras sold during this time period have come from the Sony brand. [VK] Note! it is not units sold - it is money they got for overpriced new cameras! Much of Sony’s recent success has been driven by sales of the acclaimed α7R III and α7 III models, as well as the rapid adoption of the α9 camera amongst professional sports photographers and photojournalists. The brand’s extremely active community has played a major part as well, as evidenced by the strong engagement on key social platforms like Instagram, where the official @SonyAlpha page has just surpassed the coveted one million followers count. All key information regarding Sony’s “Be Alpha” movement, including the campaign launch video, will be hosted at www.alphauniverse.com/BeAlpha. This page will be continually updated with information on new events, content pieces and more.